Yesterday I picked up my son from after school care and as we were driving up our street, a few houses from ours we saw a house with Christmas lights on the bushes. I couldn't believe it, then today they had added lights around the front door and as I glanced over I saw through the curtains a Christmas tree all lit up - I honestly can't believe they already had their tree up. It's not even Thanksgiving and people are hanging lights and putting up tree's - there is even one radio station that has been playing Christmas tunes for the past two weeks, I'm not ready for this. I still have to buy a turkey....let alone think about a tree and hanging stockings. In honor of Thanksgiving and as an item in a fall contest I have created table name cards. Set of 12, hand cut and folded; with floral and paisley coordinating paper on the backs. 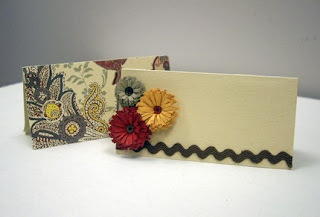 On the fronts of each card I have a thin chocolate brown ric rac and 3 fall colored fringed flowers - I think they turned out so nice. I went to a scrapbook crop this past Saturday and one of the women there kept trying to take them, she really liked them; that made me feel good.